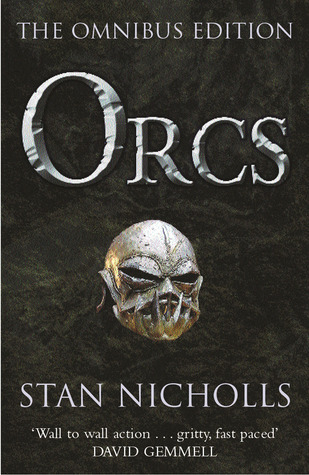 The Orcs Omnibus is the complete collection of the Orcs: First Blood trilogy by Stan Nicholls. I was initially intrigued by the idea of a book written about and from the Orcish perspective. They are after all the much maligned evil cannon fodder of many a genre fantasy and it would be interesting to read a story from their point of view. Unfortunately this is where I ran into the first let down of this series. The Orcs of this book don’t read like ‘real’ Orcs. Ok, Ok so no Orcs are actually real, but Nicholl’s Orcs are effectively ‘noble savages’, that is pretty typical fantasy barbarians who happen to have lightly green and clammy skin, brutish looking faces, and a propensity for physical violence. Unfortunately if you took out the visuals they would resemble half a dozen other barbarian races that inhabit fantasyland. There are occasional flashes of humour, especially when the Orcs joke about living up to their stereotypes (most notably early on in the opening sequence when they joke about eating a human baby… doesn’t sound funny when it is put like that but it is worth a short chuckle when you read it in context.) but ultimately there is little about them that distinguished Orcs from any other race. So rather than this being a book that redresses the balance and gives you the Orcish perspective, it is just one more quest trilogy about misunderstood noble/honourable barbarians. That out of the way, what of the rest of the books? Well,problematically this is a run of the mill, fantasy by the numbers, plot coupon collecting quest travelogue. Most fantasy authors are allowed a pass on the occasional use of Deus ex Machina plot interventions,Nicholls uses up not only his allocation but that of David Gemmell, Tad Williams and Robert Jordan. We can forgive the ‘I overheard this is the tavern, the item we seek is in the ruins of …’ when it appears once or twice, but every time the Orcs complete one aspect of the quest they luckily overhear or are directly told of where the next item is. It is unfortunately that obvious and weak. The plot is actually that simple. They have to find a bunch of magical items. One after the other. In remarkably similar circumstances each time. Nicholls tries to disguise this bald faced joke of a plot by adding in an evil sorceress hell bent on taking over the land (because that is an original twist), two warring communities of humans arguing over religion (mono- versus polytheistic, simplistically handled and never actually engages with the religious arguments) and a barrel-load of magical creatures who all apparently lived in harmony until the humans showed up. To be fair the evil sorceress, Jennesta, starts off as a decent, power hungry, evil villain. Unfortunately she becomes a ridiculous caricature of a super villain who constantly orders people hanged, flogged or randomly executed in every scene she is in. It gets tiresome. At no point do you believe that her armies would serve her willingly and that no-one has every once thought that a coup wasn’t the way to go. The central band of Orcs, led by Stryke, are as un-Orcish as you can imagine. They joke, they argue good naturedly, they are honourable, they care about one another and even make sure that a human baby left alive after the war band gutted and sacked a human village is left next to another human settlement to be looked after. In short they are not really Orcs at all. Stryke leads his band of merry warriors on a ridiculously linear quest, with the veteran healer, the token female warrior who is just as tough as the boys, the stereotypical nay-sayer who will still back you up when the chips are down and the token outsider (the Dwarf Jup) who proves that the band isn’t racist and is an equal opportunity raiding horde. The writing is prosaic with over use of words like ‘Grunts’ (referring to the un-named band members) and ‘Hatchlings’ (baby Orcs) which are just there to remind you that they are actually Orcs and not humans despite all appearances to the contrary. Despite all this there are a couple of really neat ideas in the series. Each ‘elder race’, and by elder race Nicholls means fantasy stereotype, has their own form of innate magic ranging from abilities to find gold, abilities to float, abilities to find food and so on. So it is an interesting approach to magic that doesn’t rely on who can lob the biggest fireball. The numerous races (I think he went through an encyclopedia of magical races and tried to find one for every letter) are interesting adaptations of traditional creatures. The centaurs are rowdy hedonistic world class armourers, Nyadds are militaristic sentient sea-slugs, Gremlins, Goblins, Elves, Fairies, Pixies, etc etc… it seems almost endless. But there are some good moments, as when the Orcs are drugged out of their mind on Fantasy Crack and start eating handfuls of glowing fairies. The idea of fantasy crack is again a great one and not only are all the elder races drug addicts but there are a couple of drugs that they will trade almost anything for. But moments of innovation and flashes of inspiration in the series are few and far between. All in all it is not really worth the time to read as there is so much fantasy out there worth reading, but if you have nothing better to do in an airport then by all means pick it up. Just don’t fret if you accidentally leave it behind. This entry was posted in Review and tagged Fantasy, Orcs, Review, Stan Nicholls. Bookmark the permalink. I found this series really disappointing – what I wanted was a book from an authentic fantasy orc’s perspective, showing their culture and viewpoint. Instead, Nicholls has just swapped the colours; the green ones are the good guys now, and the brutish bad guys are the humans. I get that it’s difficult to present a truly alien perspective, but “Orcs” barely tries for it – as you say, they’re barbarians with minor physical differences. The other thing that bugged me about this series was the violence – there’s little sense of danger at any point. After almost every battle, there’s a brief mention of the fact that no one important was hurt or died. After a few battles, it drains off the tension – it’s clear that no one important will be hurt, and so the fights become filler rather than the climaxes of scenes. Battle in books needs to have stakes. I really wanted to like these books, because I’ve been looking for non-human perspectives in fantasy for ages. They just didn’t pull it off. Wow, how tastes can vary. I absolutely love the entire Orcs-saga and I think Nicholls has done an incredible job creating a whole new perspective on this intriguing fantasy race. He does not just let humans and Orcs swap the respectively good and bad guy-role, but he created a believable and entertaining Orc-history and culture. I re-read the Orc-books every two years or so, and it never stops to be entertaining. I would recommend this series to anyone who loves fantasy.